The highlight of the village year - lots of fun for everyone - do volunteer to help and make sure you put the date in your calendar now! All villagers are welcome to this meeting where we talk about events to hold and how to organise them. 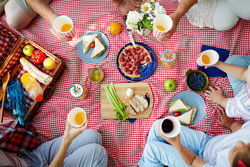 Come along and join villagers at this informal lunchtime picnic in the grounds of The Rectory - bring your own food and drink and something to sit on!